A 28 yo male, C/o slow progressive ataxia and slurred speech. On neurological examination nystagmus, altered cognition. Family history significant. 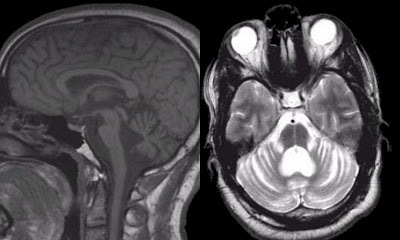 Marked atrophy of the cerebellum and Brain stem, compensatory enlargement of adjacent Cp angle cisterns and fourth ventricle. Imaging findings and history is consistent with a clinical diagnosis of Spinocerebellar Degeneration - Spino Cerebellar Ataxia. Atrophy confined to cerebellum and Pons is an imaging wise diagnostic clue. These neurodegenerative disorders, once termed Olivo Ponto Cerebellar Atrophy (OPCA), comprise a large group of inherited disorders characterized by progressive ataxia and brainstem signs. DNA analysis in this patient demonstrated SCA Type 2; typically manifests with progressive gait and limb ataxia, dysarthria and slow saccadic eye movements. The SCA-2 mutation is an expansion of an unstable CAG repeat located in the ataxin-2 gene on chromosome 12q24.1.